I'm worried I'm too late with this recipe. It's March now, and you've probably moved away from tea and warm beverages and onto iced coffees and fruity drinks with umbrellas because SUNSHINE. I know, I'm ready for sunshine and spring too. 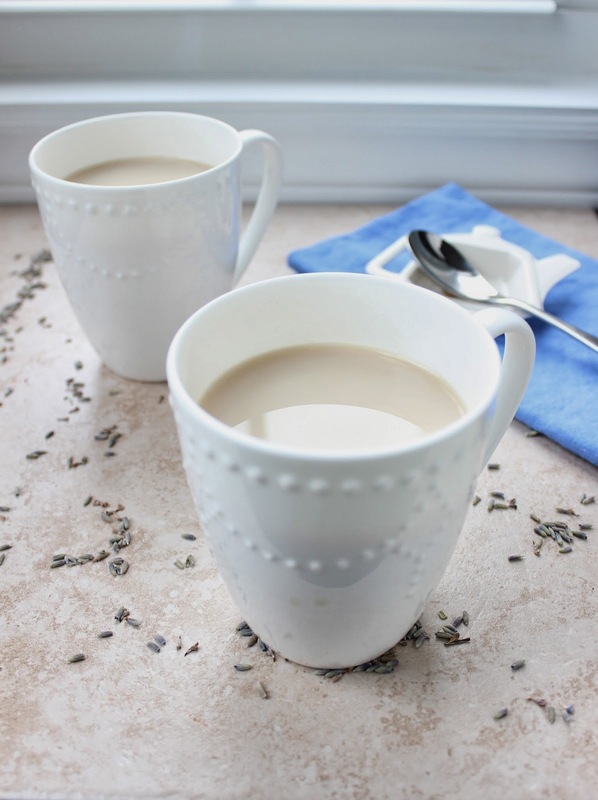 But the truth is March still has some chilly weather, I woke up with a cold this morning, and this lavender earl grey tea latte is the most calming and luxurious drink I've ever had. Milk + honey + vanilla. Things that are supposed to go together. 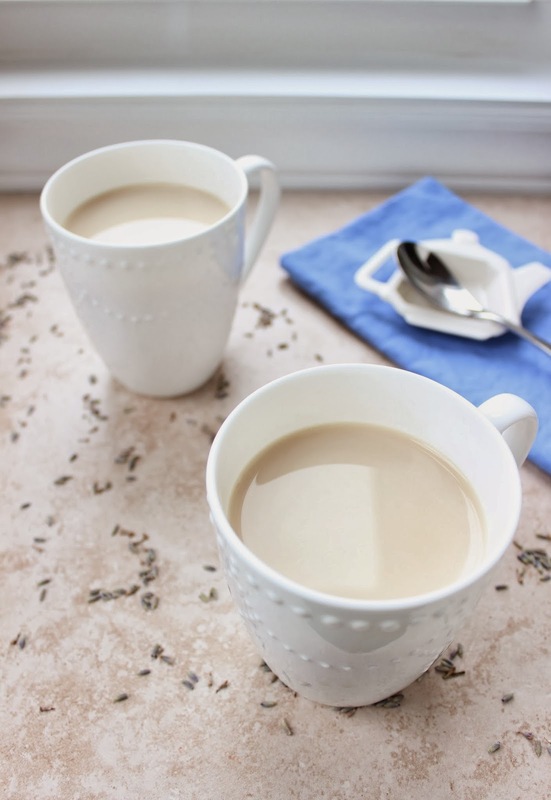 Hot water + earl grey tea + lavender buds. Aromatic, calming. A perfect match. Don't believe me? Check out Lavender Earl Grey Macaroons, Lavender Earl Grey Scones or Lavender Cupcakes with Earl Grey Icing. I've written before about my infatuation with lavender. The key here is moderation. A little lavender goes a long way to relaxing drink heaven. A lot = drinking potpourri. Drinking this sort of British tea with milk makes me think of this article on tea people vs. coffee people. I like to think I'm a combination between the two, but let's be honest. I'm a tea person. I'll take being curled up with this tea latte and a good book over a loud cafe with espresso any day. As for British guys vs Italian guys?? Heat milk, honey, and vanilla extract in a small saucepan over medium-low heat until warm. 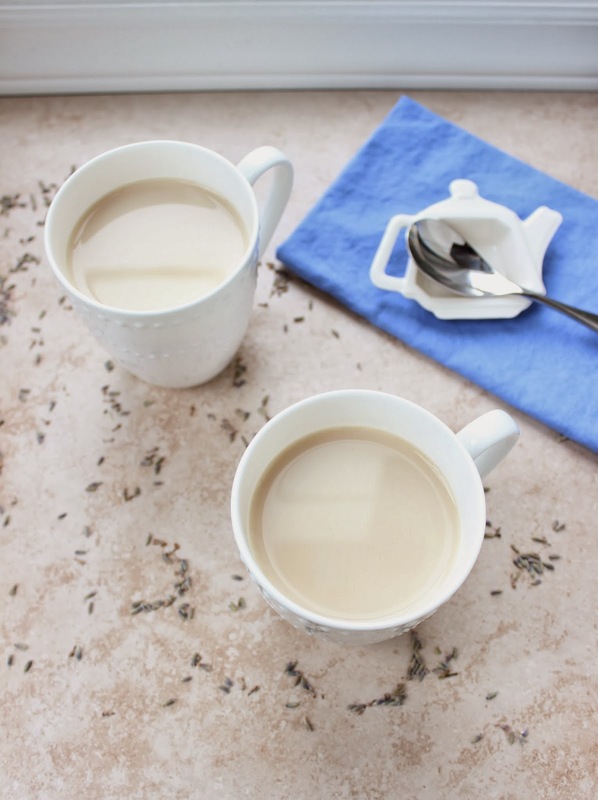 Add tea bag and lavender petals to hot water. Let steep for 3-5 minutes. Pour through a fine stranger and into the two mugs to remove petals. Pour warm sweetened milk into the mugs. Inhale deeply into the mug. Breathe. Find somewhere cozy to hole up and relax. I don't know where this "spring" is of which you speak but it's definitely not here in NYC! I'll take a latte!! I'll never say no to warm beverages NOPE! I like them way too much to cut down on them, you know. And this one looks great! I love both coffee and tea far too much to choose! And it's DEFINITELY still cold enough. It snowed here tonight so I had a big mug of hot chocolate and a cookie after dinner! Did you use the culinary lavender? ?